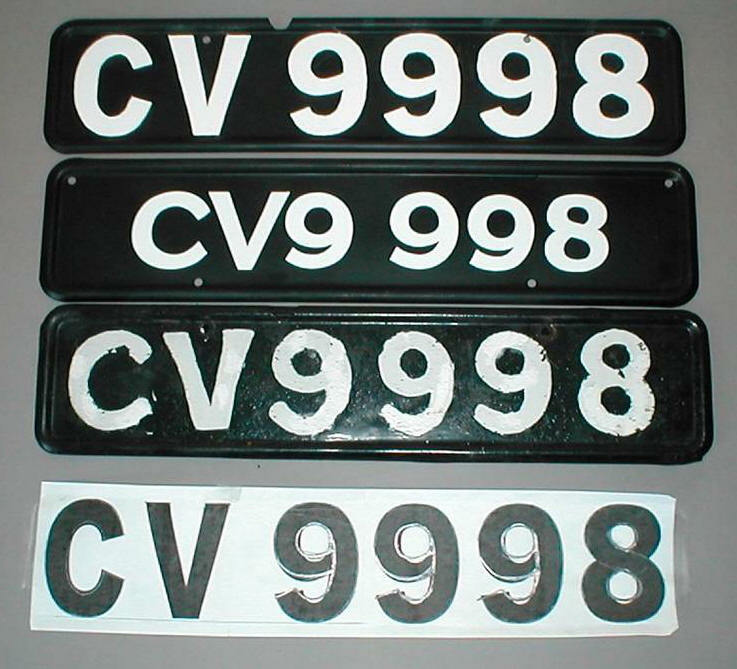 The original number plates on my Box Saloon CV 9998 do not look right to me and part of the paint was in fact 'Snow pake' to get the car through the MOT (third plate down in photo - It looks better than the real one) I wanted a pair of number plates that looked good, hand painted, but without sending them away and paying a lot of money out. First I established what should be the correct lettering for the 1930 requirements. I thought lets get a professional sign writer to do it, they seem to be able to apply a thin film of paint evenly. The result is the second plate down in the photo - It cost £12, so not a great deal lost. I thought I can do this and set about finding a easy way to get the letters in outline on the plates and then fill them in with paint. Font: Arial Black; Font size: 350 = 3.5"; Scaling: about 75% (each letter / number varied). I then printed this and smoothed out the lines / curves . (bottom of first photo) also it has to be admitted I tweaked the spacing until I felt the all looked as if the spacing between the figures was balanced, this probably stems from drawing out the Roman alphabet many times as a trainee architectural draughtsman, a long time ago. The back of the print was then rubbed with white chalk and the print then laid over the number plate and with a pencil follow round the outline of the figures. This leaves a white line on the number plate (see separate photo) which was filled in with white paint. Now I have traditional looking plates (top plate in first photo). This article, written by Sandy Croall, originally appeared in CA7C Seven Focus in Aug 2006 pp24-25.